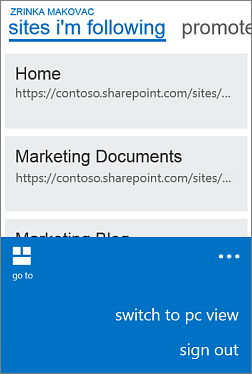 If you’re using an Android phone or tablet and your Office 365 subscription includes SharePoint Online, you can use your device to view sites, such as team sites in SharePoint Online. You can also view files that are in your OneDrive for Business library. This makes it easy to view information on sites, collaborate with colleagues, access shared documents, and stay connected with your work. Recent improvements have made SharePoint Online even more touch-friendly than before. For more details, see SharePoint Online introduces the Touch Design mobile experience. In the address bar, type the website address (URL) for SharePoint Online. For example, our URL is http://contoso14.sharepoint.com. Your URL will include your domain name instead of Contoso14. Sign in using your work or school account. In the navigation links across the top of the screen, choose Sites. 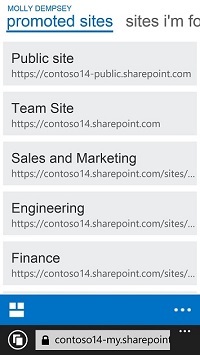 You'll see a list of SharePoint sites organized into lists, such as Sites I'm Following and Promoted Sites. Choose a site, such as Team Site. In the address bar, type the website address (URL) for your site in SharePoint Online. For example, our URL is http://contoso14-my.sharepoint.com. In the navigation links across the top of the screen, choose OneDrive. You can choose between two kinds of views—mobile view and pc view—for some kinds of SharePoint sites and your OneDrive for Business library. In mobile view, you see the site formatted to display nicely on your device. In pc view, you see navigation links across the top of the page. 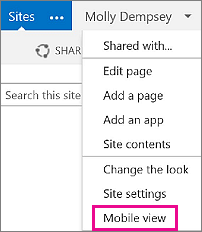 Note: Mobile view might not be available for all of your SharePoint sites. When mobile view is not available, sites are displayed in pc view automatically. In a site or library, touch the ellipsis (…) in the lower right corner of the screen. Choose Switch to pc view. In the SharePoint site, in the upper right corner of the screen, touch Settings ( ). In the Settings menu, choose Mobile View. For more information, see Use a mobile device to work with SharePoint Online sites.